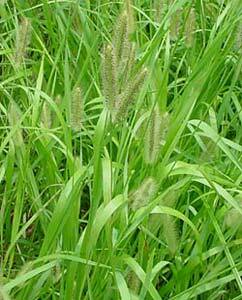 Foxtails are here, your pet’s enemy! 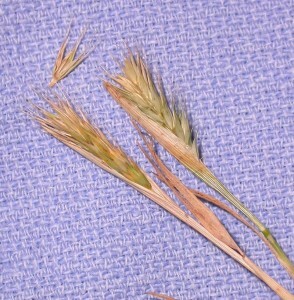 Foxtails, I hate them. It’s that time again and weekly, I picked out 4 infected foxtails out of the armpits of a dog being groomed with mats making the matters worse. This will be a part of my daily work until end of October so here it goes…. They are a weed that looks like a bushy tail and when dry or brittle can enter your pet’s body like a fish hook that can cause a world of problems on short and long hair breeds. It goes into the skin, spines can break. In fact, there are barbs on the barbs. Once these things get started in, they can embed firmly and don’t come out very easily. If you have a medium to long hair dog, combing and brushing after EVERY outing at dog parks, hikes, yards, etc is helpful. Check in and around pets ears, eyes, between toes and pads, underarms, everywhere. Early detection can help you prevent an infection or abcess. Unfortunately this is a problem until Fall. Last year, about 5 dogs a week in the my grooming world had foxtails, only to return with the same scenario on the next visit with explanations of how they went on hikes or dog parks yet didn’t remove them. This is routine for a groomer and we’re there to help. The barbs can initially be caught on the fur or hair then later that night when you pet is rolling in its bed cause the barb to get closer to its body or enter the skin. They can travel within the body and in severe cases have been known to hit vital organs or even death in very extreme cases. One up the nostril with symptoms of constant sneezing and pawing at nose. Simply from sniffing near a cluster of them caused this $$$ vet bill. One in the ear straight heading near the eardrum with constant head shaking like getting water out of the ear. Beetle had swallowed some last year and a trip to the vet with anesthesia, probed down the throat and no trace of evidence. $300 bill. The symptoms were wretching, hacking, can’t swallow, and vomiting. I also have to pull them out of my indoor/outdoor cat’s fur, thank god he’s black for easy detection. I am so not looking forward to this for my pets after a horrible time last year. Like a cactus, keep them away as much as possible or be informed how to keep your pet be safe and pain free. This entry was posted in Health Tips by Vanessa. Bookmark the permalink.